This is the time of year when we take time to look back over the goals we made for the year. It's encouraging to see our progress, plus it helps us decide what our next steps are going to be in the coming year. Here's the progress we made on each. Rather than individual goals for the house, we had a project list that was more like a list of steps. continue replacing siding on the house - good progress here. Basically, we work on siding as we replace windows in whatever room we're working on. We have several places that need fencing. The first was to fence an area of the woods as a browse for our does. Detail from our 2012 Master Plan. The red line is the proposed fence. I started clearing a line for the fence last January, after all the kudzu and blackberries had died back for the winter ("Trailblazing The Property Line"). Progress stopped in February, because of all the rain we'd been having ("Non-Progress on the New Fence"). Rain continued to be a deterrent all summer. This month we resumed work on that fence again. I hope to be able to announce that it's completed soon. This was the first goal checked off the 2013 goal list. We got a system set up in January, but had to fix a leak. It's amazing how much we can collect off a small section of roof. 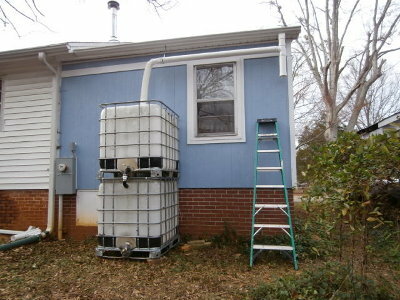 We hope to eventually add one to each downspout plus our outbuildings. cushaw winter squash, pak choy, and tatume summer squash. I didn't actually set any goals for the garden, but I did try to challenge myself to accomplish and record at least one thing daily of working toward year around independent eating (I did that on my Garden Journal). Eventually just having to find time to do this became too time consuming. Not that it took a lot of time; I just have too much else to do until it was no longer a priority. Our quarter acre buck pasture. Minerals added & ready to plant. This year's goal was our small buck pasture ("Soil Remineralization: Year 2"). After remineralizing, we planted field corn and cowpeas. After these were harvested I sowed annual rye for a winter pasture and we let the boys back in to munch down the stalks and vines. Our newly built goat shelter. This is one goal we made progress on in spite of so many rainy days. We wanted to build two: one for the bucks while we grew field corn in their pasture, and one for pigs. We got the goat shelter done, but decided to wait on getting pigs. Floor plan for a goat barn. Click for larger. Details here. Besides constructing new shelters, we also have two (three if we count the carport) old structures which are in need of either repair or demolition. We have discussed everything from repairing and re-using, to tearing down and starting over. We especially need a better setup for the goats. We finally decided to tear down the largest of our two outbuildings and build a new structure in its footprint. However, before we can do that, we have to clear it out. 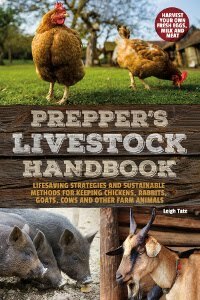 We've been using it for hay storage, garden tools and equipment, and Dan's workshop. All of these things need new homes, but we have made a beginning. More on that soon. All in all, I think we accomplished much this year and made good progress. It's a rewarding feeling. Next post, goals for 2014. You've had a productive year! Continue progress in the new year! It feels so good to get things done. I find it so interesting that so often, words on a page to describe what needs to be done or what has been done cannot fully capture how much is required to accomplish it. You two have managed to do so much together. Congratulations on a beautiful year! Congrats on all you got done! It was definitely a productive year, even with the weird weather. Hope 2014 blesses you and Dan beyond measure! Quite the list and quite the accomplishments for 2013! Hooray! Of course as stated a list makes it seem so easy to have done. Nothing strikes as much fear into Gene's heart as the words" You know I was thinking, it doesn't seem it would be too difficult to......"
Happy New Year Leigh and Dan! Hoping that your plans all work out. Happy New Year! 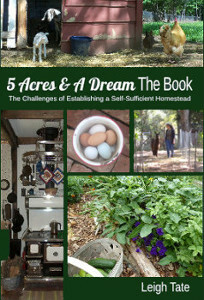 I'm a new reader that just found your blog and I find your 5 acre dream very inspiring! Congratulations on having such a productive year. Now that's a productive year. When do you find time to breath? Looks like a good year and a good way to divide up all your goals! I've just finished reading your book, as I added to my Christmas list at the last minute - I'll post a review on my blog soon (and don't worry I loved it). The goat shelter look really good and fencing is a never ending job so don't get disheartened! Here's to a good 2014! You've stumbled upon our dilemma, storage! It can be overwhelming sometimes, what to do about it. Especially when there are other projects waiting behind resolving that one solution. Where Oh Where Did My Guineas Go?? ?